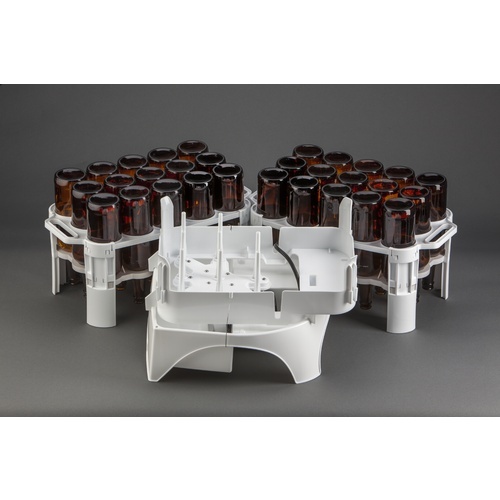 Looking for a high quality bottle washer to make cleaning bottles a breeze? This add on system to Mark's Keg and Carboy Washer makes cleaning bottles easy. 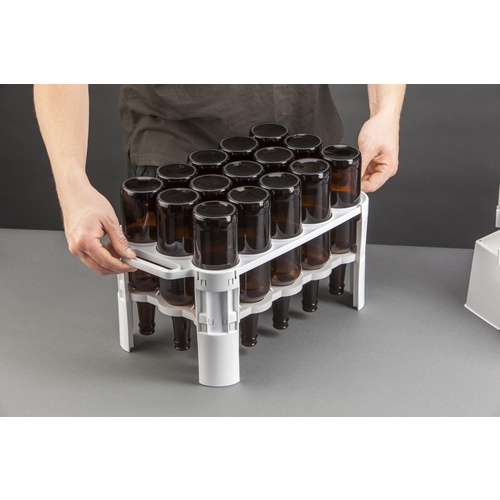 Never again have to scrub out bottles or worry about whether anything is left over to spoil your beer. Simply set up Mark's Bottle Washer system, and let it do the work for you! This add on will use the basin and pump from the Keg and Carboy washer, and direct the water through a manifold, which ends in powerful jets to clean your bottles. The cleaning solution drains back to the basin to be recycled through the system again! Please Note: This is an add on system for Mark's Keg and Carboy Washer, and will not function without that base. To speed bottle washing and sanitizing time. I want to ensure my bottles are 100% clean... PBW and star san will do that. Manually scrubbing and dishwasher won't. Will it do all bottle sizes or for some reason only 22 oz bottles? BEST ANSWER: You can fit on 12oz bottles, but it is just a little bit cockeyed on the stand for some bottles. I have not tried .5L or 1L swingtops with this yet. It can handle 12, 16/17, and 22 oz bottles well. Wasted Money - Why can't I give it zero stars? The carboy washer is awesome, but this attachment for it wound up in the garbage. My experience was that the pressure from the pump was insufficient for 15 bottles, especially when the manifold leaks like a basket. I normally keg my brews but do bottle up a batch now and then for friends without kegerators. I'm never sure how bottles are cleaned/stored after being emptied, and this bottle washer system blasts EveryThing out of the bottles that shouldn't be there. I use hot water and PBW, then rinse, then a nonfoaming sanitizer. It takes a little time but I'm cleaning 60 (five cases) of 22oz bottles so in the end it's a very efficient way to get the cleaning done well. It isn't perfect. Like another reviewer, I have rube goldberged a way to keep the manifold from tipping, otherwise it tips away from the bottles at the end of the bottle rack and the bottles can partially fill with liquid when this happens. I normally quickly start and stop the washer pump a couple of times at the end of the cycle to thoroughly "rinse" each bottle. If the bottles do begin to fill with liquid instead of continuously draining during the cleaning cycle, a ring of foam can form inside the bottles. The quick start/stop ensures that any foam inside the bottle is rinsed away. The assembly does take a bit of time and attention, but that wasn't an issue for me because it saves me a lot of time in the end. Disappointed on how much assembly required to get this thing going. Takes up way too much time IMO. This thing is pretty awesome. If you combine it with the blichmann beer gun, it actually makes bottling bearable. ?? One of my favorite brewing gizmos! Bought Mark's Keg washer for Christmas 2016 and it totally transformed my brewing! One day while sanitizing bottles, I thought about how nice it would be if there was some kind of attachment so that I could sanitize bottles as easily as I sanitize my carboys. Lo and behold...it actually existed! So far, I have used this to bottle 14 brews and can't imagine bottling day without it! Just mix up some PBW or Saniclean (NOT StarSan!) and plug it in. It's kind of a pain to assemble and you need to have someplace to store it as it's kind of awkward once it's all put together. The plastic is a little thin and seems flimsy, but I'm mindful of that fact and handle it carefully and have never broken a single bottle. I would buy this again in a heartbeat! Thanks Mark and thanks MoreBeer! Excellent idea with very good delivery. Easily cleans 12, 16, 22 oz bottles with minimal water + sanitizer and no PBW. Racks double as drying rack. This machine works great on my 30 bottles! I was amazed at how much "gunk" washed out of my bottles. Also the sanitized water turned a light brown so I had clearly not rinsed them well when I emptied them as I had thought! I am getting used to Star-San & not clear about how much to put in. A little Star-San goes a long way & if you put in too much, the foaming inside the bottles will foul the water jet directed at the bottle bottoms. with this machine, the foam will build inside the bottle until it impedes with the vertical spray coming out of the nozzles. Then the spray will not reach the bottom of the inverted bottles. Lifting the bottles a little while the spray was running permitted more water & foam to exit the bottle neck. And all was fine for another 8 minutes. I guess this is one time when the foaming action of Star-San may be an undesirable. So don't use as much Star-San. The bottles will still be sanitized. A cap fun from a 4 ounce bottle is all you need in the reservoir (basin) of this machine. I will get past that & put in less Star-San because this machine really whips it up & makes Star-San a thick foam! But the washer works great! I had no problems in operation & found it to be constructed of a good plastic which will hold the load. 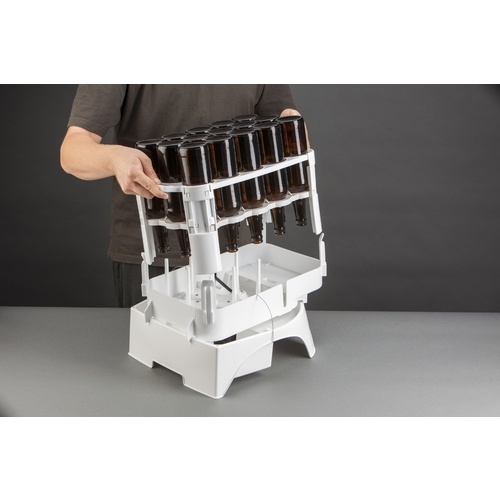 When I bottle, I am going to use the bottle racks to hold the filled bottles upright until I begin removing them one by one to cap them! Remove an empty inverted one, fill it, cap it, place it back into the rack upright. In fact, place it back inverted, checking for leaks or poor seals. Then transfer to cartons for storage & bottle aging! But that is my .02 dollars! First off, I really love the idea of sanitizing several (if only 22 ounce) bottles at a time. Sadly, the washer has some pretty frustrating flaws that make it more difficult to use than it should be. Unlike the previous reviewer, I haven't had any issues with the manifold. The drip and bottle trays are a different story entirely. I too feel that there should be a better mechanism for holding the manifold in place. I have placed the bottle tray on the drip tray, and not realized that one of the jets wasn't placed inside a bottle. Not catastrophic, but can make a mess. Also, the plastic and design of the bottle trays is not suited for the application. The plastic feels flimsy, and I would NEVER carry the trays by the molded handles themselves, when full of bottles. Unless you want broken glass on your floor, lift the trays from the bottom. These two issues make it slightly difficult to handle and position the bottle trays. Despite its flaws, the bottle washer is a good idea, and it does seem to work. I've been using it to sanitize my bottles, and I'm happy with the results. Also, it's cool that Mark (the creator) reached out to the previous reviewer. With some refinement, this would be a really great product. I feel really uncomfortable posting the first review on this product and it be unfavorable for the product. But I can not get around it. First off the bottle washer is made of thin relatively soft plastic with two thin plastic tabs holding the manifold in place on the base. The manifold easily rocks forward changing angle of the spray nozzles. I had to use homemade shims to solve this problem. The first time I sanitized bottles the manifold gasket blew out so I tightened the wing nuts beyond snug and found the plastic of manifold is so soft and thin the I had tweaked the entire unit slightly. It is still usable but I have no faith that this unit will last. I also found that Star San foams up in some of the bottles and prevents the jet from reaching the bottom of the bottle. I would not recommend this product in it current form. It should be made of sturdier materials given the heft of 22 oz bottles.